The audio system that comes with many television sets is mediocre at most. Boosting the audio performance of your TV may require the addition of the best wireless speaker. You can enjoy listening to TV by making use of the Bluetooth connection. 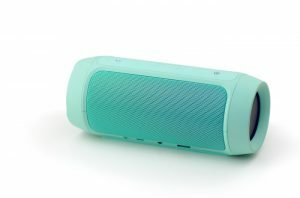 There are many wireless speakers available from many brands like Sony, Anker and Ultimate Ears. Choosing the best wireless speaker for your TV might look complicated, but we’re here to help you out in that regard. Continue reading through this page as we give you a guide on how to choose the best wireless speaker for your TV, along with a ranked list of our recommended wireless speakers. In this segment, we’re going to show you the important factors to consider when you’re out on the market looking for the best wireless speaker for your TV. Perhaps one of the best qualities of wireless speakers is their portability which makes it relatively easy to install these devices practically anywhere around the house (as long as it’s within transmission range). However, its audio quality is not good compared to wired speakers. It is because the audio data need to be compressed in order to send it as a radio wave. However, wireless speakers now take advantage of codecs to help boost connection and audio quality. 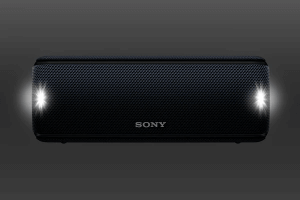 One codec to note is Sony’s LDAC (developed back in 2015) as it allows the speaker to deliver high-resolution sound. 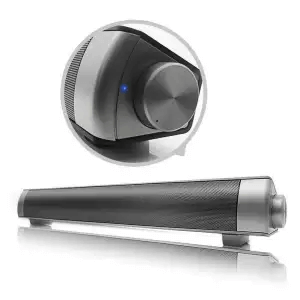 Even though it’s possible to do a rough check on the speaker’s audio quality by looking at the device’s specifications, you cannot perfectly know its actual sound without using it. It’s best to take a look at online reviews to see (or hear) the opinions of verified users. The process of compressing sound for faster transmission is called a codec. 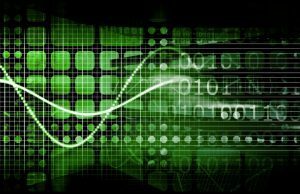 There are four main types of codecs, and these technologies greatly affect the sound quality. Always check the information regarding the codec used by both the TV and the wireless speaker to bring out the best audio performance for the delight of your ears. The recommended codecs for listening to high-resolution audio are AAC, aptX, and LDAC. Of course, checking for compatibility is your top priority so as not to encounter any regrets after the purchase. It’s because pairing TV’s with wireless speakers using different codecs may result in low-quality audio performance. Now, without further ado, here are the features of each codec so kindly check them out. SBC prioritizes maximum compatibility for most wireless speakers, but the high-frequency range disappears during the compression process. As a result, audio quality is low. There are also other problems such as sound delays and unnecessary noise. Although it may seem that wireless speakers using SBC doesn’t promote plenty of advantages, it does keep the price tag as low as possible. Also, if the TV and the speaker don’t share the same codec, then SBC will take charge of the compression. AAC has the same compression rate as SBC, but this time there’s almost no time lag during wireless transmissions. Also, AAC keeps the high frequency of audio files making audio-listening experiences more pleasant than using SBC. Apple products like the iPhone and iPad primarily use AAC in their devices. aptX takes advantage of a lower compression rate as compared to SBC. In doing so, wireless devices that use this codec can deliver CD-like audio quality. Furthermore, there’s almost no time lag during the wireless transmission. For comparison’s sake, SBC tends to have a delay of 200 to 250 ms whereas aptX will only have 32 ms.
Sony’s LDAC enables high-speed wireless data transmission that’s three times faster than SBC. Devices that use this codec combines wireless comfort with high-resolution audio playback. 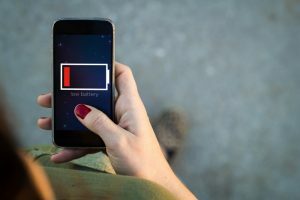 Different Bluetooth technologies call for varying performances in handling battery life and wireless communication speeds. For example, there’s about a 60% difference between Bluetooth v3.0 and 4.0 regarding battery power consumption. Let’s check out the different Bluetooth versions already available on the market to help you decide the right wireless speaker for your TV. 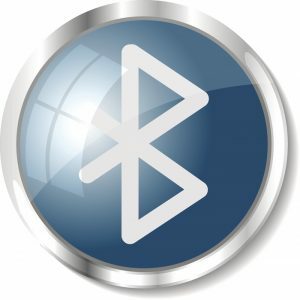 The latest version of Bluetooth is v5.0, and it appeared to the public back in January 2016. Bluetooth technology is continuously evolving as wireless communication speeds and power efficiency features become better with each update. Bluetooth technologies are backward compatible, so users won’t get the full advantage if both devices don’t have the same versions. ver1.2: Deal with interferences occurred when using wireless LAN using the 2.4 GHz band. ver2.0: Incorporated EDR correspondence to boost data transfer rate up to three times faster. ver2.1: Power saving mode introduced to extend the battery life of devices up to five times longer. ver3.0: Increased wireless transfer rate up to 24 Mbps and enhanced power efficiency feature. ver4.0: Introduced Bluetooth Low Energy (BLE) to boost power saving even further. ver4.2: Introduced IPV6/6 LowPan support. ver5.0: Enhanced wireless communication speed two times and communication range four times in comparison with ver4.2. The communication standard for Bluetooth devices regarding distance is called Class. Consider the Bluetooth class when you’re thinking about the installation location of your wireless speaker. Class 1: Wireless communication distance up to 100m. Class 2: Wireless communication distance up to 10m. Class 3: Wireless communication distance up to 1m. Keep in mind that the power consumption increases as the distance increases. Aside from the sound quality, the battery life is regarded as one of the most important features of wireless products. Simply speaking, the longer the battery life, the more you can enjoy its wireless capabilities. You might feel like listening to movies, music, and TV shows in the kitchen. However, transferring the device to moist or damp areas can be asking for trouble. 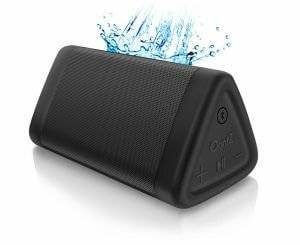 Having a wireless speaker with a waterproof housing is necessary for these scenarios. IPX 4: Prevents damaging effects from splashes coming from all directions. IPX 5: Prevents damaging effects from jet water coming from all directions. IPX 6: Prevents damaging effects from strong jet water coming from all directions. IPX 7: Allow temporary submersion of up to 30 minutes. IPX 8: Allow temporary submersion under constant water (e.g. swimming pool) of up to 1m in depth. It’s time to check out our list of the best wireless speakers for TV’s in the Philippine market. We considered the products’ price, battery life, audio quality, Bluetooth technology, and other features, so please check them out to help you decide which model to buy. 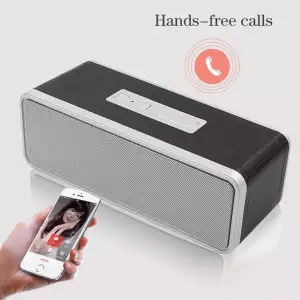 Sharing wireless technology with friends and family is a joyous experience, and this Bluetooth speaker is very compact that you can fit it inside a small bag or your pocket without any problem. The small size does offer an audio performance with a decent level of clarity. Its petite design does mean that its drivers won’t deliver explosive bass. Still, it does come with an innovative feature that allows you to control your smartphone camera’s shutter with this device. 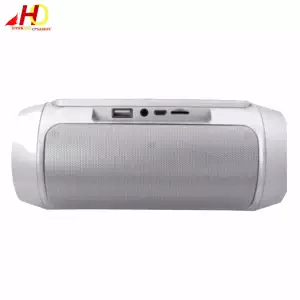 If you don’t have much space on your desk or just want to keep a speaker in your pocket to enjoy the sound of TV wherever you are at home, this might be the best product for you. 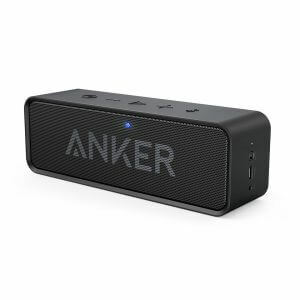 Many wireless speakers within the ₱ 400 to ₱ 600 price range only carry battery lives that last about 3 to 5 hours of continuous playback. Thankfully, this model has a 6000mAH battery that gives you up to 12 hours of playtime. Also, the volume is satisfyingly loud. Hence, this model is not just a good choice for watching shows in a large room but also when you want to listen to music at the pool or beach. 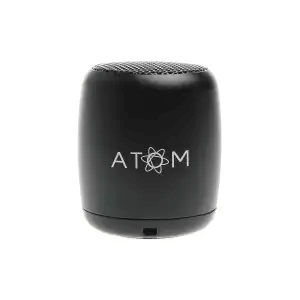 While there are some wireless speakers that enhance the quality of vocals in shows, movies, and music, this product helps bring out the best in explosive scenes. 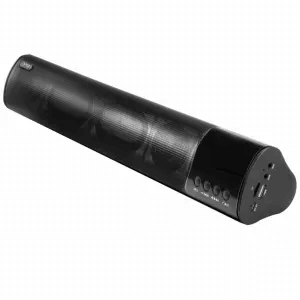 It comes equipped with two 45mm 3W amplifier speakers to deliver bass with plenty of punch. There’s a very loud voice that plays when turning on the device, and it can be an annoyance for some people. After you get past that voice, you now have a great partner for watching action shows and movies. If you’re looking for a good wireless speaker that offers a decent punch in the lows, then this might be the next device for your home entertainment system. It has passive radiators that allows for a smooth audio experience while preserving clarity in lows. Do be careful when playing audio with this device with loud volumes as it tends to move about the surface because of the vibrations. Its audio quality makes it a good choice for watching shows in the horror, thriller, and suspense genres. Sometimes you need a large speaker to deliver good quality 360-degree audio performance, but that’s not the case with this compact model. Pairing it with a wireless capable TV allows you to hear all the action across the entire room. Bass performance, on the other hand, isn’t as punchy as other larger models, but it’s still suitably solid enough to enjoy action-packed shows and movies. Its IPX7 waterproof housing makes it an ideal choice to place in damp or wet rooms, like your kitchen. You can get wireless speakers for TV’s that can provide 12 hours of continuous playback, but if you want a device that can last longer, then this is the model you’d want. It is said to pack up to 30 hours of continuous play at moderate volume levels. However, it’s not as loud as other similar contenders primarily because of its Digital Signal Processor (DSP) that limits the maximum volume to keep the audio from distorting. Overall, this wireless speaker is an ideal choice for those binge-watching sessions. 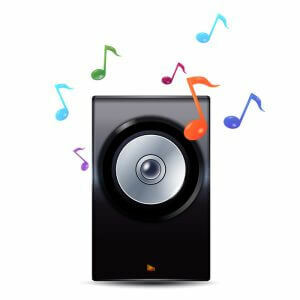 Some wireless speakers primarily focus on either the lows, mids, or highs in the audio frequency. This model, however, lets you have a taste of the good things in every part of the spectrum. The lows push the bass without sounding too muddy. The mids are nice and smooth but can lose quality in certain scenes. Lastly, the highs pierce enough without harshness at moderate volumes. For casual music listening or TV show watching, this device is a good choice. This wireless speaker gives a suitable kick in the bass department and reasonable clarity, but it does get extra points for being power efficient. It comes with an overcharge protection feature which cuts the flow of power to it when the battery’s full. At 45 cm, it’s a bit longer than many portable wireless speakers on the market making it a bit difficult to put it inside a purse or bag. However, it’s designed to stay put with your home entertainment system, even if it’s always plugged into a wall outlet. Many wireless speakers on the market take advantage of SBC for maximum compatibility, but if you’re an audiophile then you shouldn’t look further than this device. It doesn’t just support SBC but also AAC and LDAC as well for high-quality audio listening. You can even add a bit of party atmosphere when playing audio from movies or tracks thanks to the lights that change colors found on the front and sides of the device. Its a great wireless speaker for both casual TV-watching and exciting party experiences. 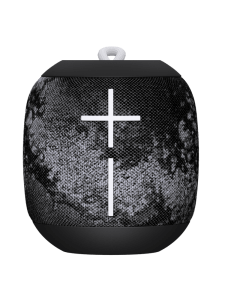 When you can’t decide on choosing a wireless speaker that focuses on a particular feature, then a model with multiple options will certainly tickle your fancy. It has a multi-room function that allows you to connect different speakers with this model through Wi-Fi to send audio across the house. The device also has Amazon’s Alexa which means you can control the speaker just by using your voice. Lastly, it has multiple support for audio such as MP3, AAC, ALAC, FLAC, and WAV. 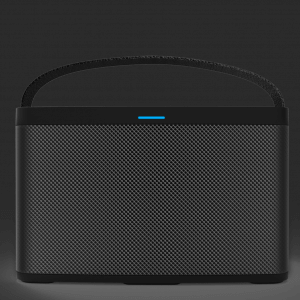 This wireless speaker makes for the ultimate versatile experience for audio. After reading our “How To” guide and our list of the best wireless speakers for TV’s on the market, you should now have a pretty good idea of what to buy. You can always take your time in checking out the products we’ve mentioned here if you still have some difficulties in choosing the right model. Once you’ve chosen the right device that fits your budget and other preferences, then you can truly claim that it’s the best speaker for your home entertainment system.